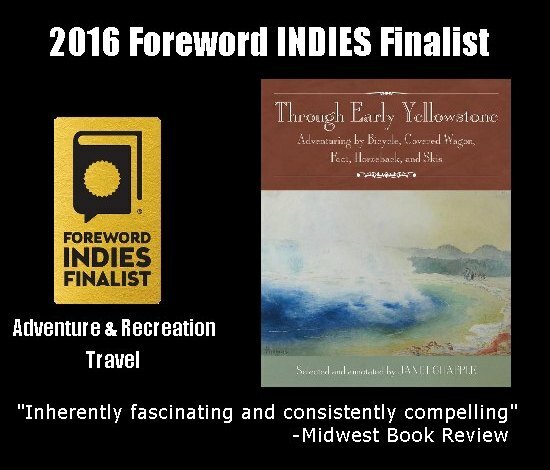 For me, guidebook editor Beth Chapple, last month was the month of the Yellowstone bus. Not only did I discover that one of my nearby aviation museums has a beautifully restored bus, but Wyoming Office of Tourism sent one over on a week tour of Seattle, to convince people to visit their state! Historic Flight Foundation keeps famous, well-restored airplanes from 1927 to 1957 in a large hangar at Paine Field, Everett, Washington. But among the planes, including a Grumman F8F Bearcat and a Beechcraft Staggerwing, is a little known secret: they own one of the tour buses built in the 1930s to convey tourists around Yosemite and Yellowstone National Parks. The museum’s website doesn’t even mention it, but it’s a beauty they’ve had since 2012. 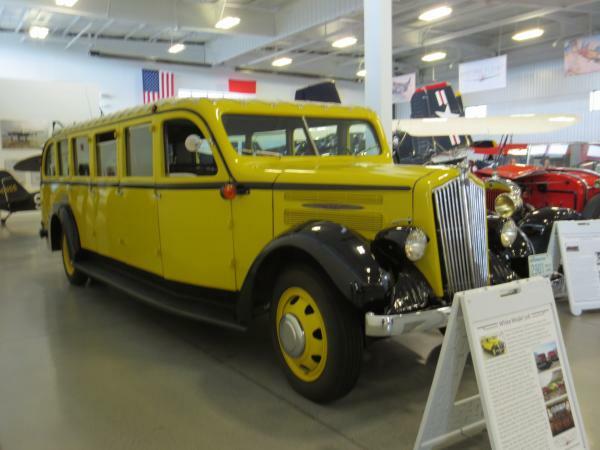 The bus was created by the White Motor Company of Cleveland in 1935. Yellowstone Park ordered 27 of the White Model 706s for the 1936 season and there were 98 in use in 1940. In the mid 1960s the remaining buses were sold. The buses were brought back to Yellowstone in 2007, and now anyone can take a half- or full-day tour of the park in one. It’s a great way to learn from your tour guide and see wildlife. 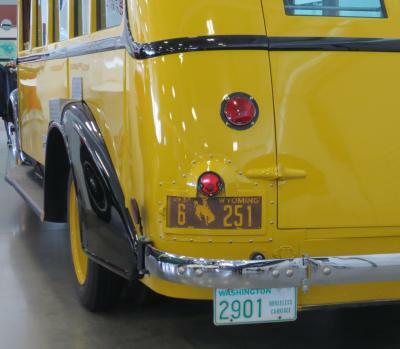 HFF’s 1937 bus has THREE license plates on the back, including Montana’s (not shown). When the bus visited Seattle, it posed at the city’s most photogenic places, including the Fremont Troll and the Space Needle. Driving the Wyoming Tourism bus was guide Leslie Quinn, according to Beth Shepherd’s post, called “Yellowstone National Park: The Wheels on the Bus Go Round and Round.” We at Granite Peak Publications know Quinn as the Xanterra interpretive specialist who wrote the latest wonderful review on our Reviews page, which we also feature on the back of the guidebook. There’s something very cheerful about glimpsing one of the historic yellow buses with the retractable canvas top. 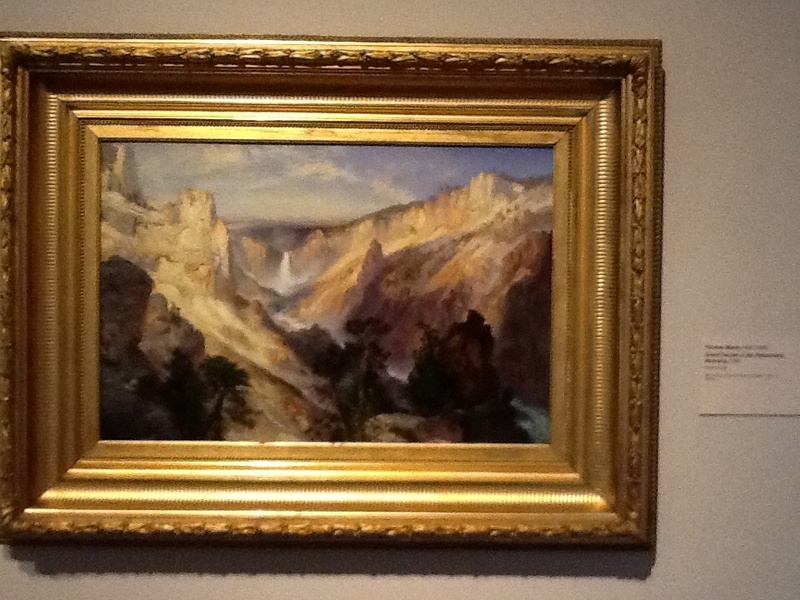 Snapshot of Grand Canyon of the Yellowstone, Wyoming, 1906, painted by Thomas Moran. It’s appropriate to post this, because painter Thomas Moran’s birthday is coming up. He was born in England on February 12, 1837. Many people think that Artist Point on the canyon rim was the place Moran sat to create his famous paintings, but that was at another spot, now called Moran Point. 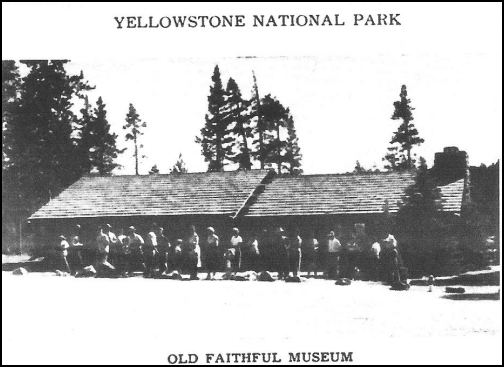 See this page in the Yellowstone Online Tour to straighten out that fact. And why do I find myself in San Francisco today? I traveled to the Bay Area to celebrate a few family birthdays, guidebook author Janet Chapple’s among them. Happy February Birthdays! Just found out via Twitter that the Whitney Western Art Museum of the Buffalo Bill Center for the West in Cody, Wyoming, has recently acquired a new painting by John Mix Stanley. What’s special is that more than 200 of that artist’s works were destroyed in a fire in 1865, so not many survive. Another bit of news is that the museum will gather about 60 works by Stanley for an exhibition called Painted Journeys: The Art of John Mix Stanley, which will open June 6, 2015. If you are interested in American art of the West, make plans to enter or leave Yellowstone Park by the East Entrance this summer! Just to let my readers know I’m still around, I’ll summarize the high points of the trip my husband Bruno and I took in the first half of May to Arizona. 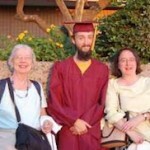 The impetus for the trip was the graduation of my grandson Zeno Dellby—in computer science from Arizona State, Tempe. The day after the graduation, pilot Beth took me for a flight-seeing ride north of Scottsdale. It’s always a treat to fly in a Cessna 172 with her. Three generations of Chapples and Dellbys, with editor Beth on the right. A very rarely blooming cactus greeted us at the Desert Botanical Garden. Leaving the Phoenix area we spent a couple of hours at their Desert Botanical Garden, a beautiful place on a not-too-hot day in May. Three nights on the South Rim of the Grand Canyon took me back there for the first time in 29 years. The last time I was there, I hiked to the bottom, stayed at Phantom Ranch, and back up the next day. Never again! Bruno took some nice shots, but I was disappointed by the amount of haze we had in all our views of the canyon, dulling the colors of the billion-year-old and more geological formations. It’s largely caused, as the rangers and others explain, by industrial pollution from as far away as China. The night we heard a ranger lecture about the geology was when the full moon was at its perigee, or closest point to the earth. No picture, but what a gorgeous sight! Onward to meet friends at the Museum of Northern Arizona, in the outskirts of Flagstaff—an excellent small museum about the geology, archeology, and art of the area. Then on to get a glimpse of Oak Creek Canyon and Sedona, where we took a Pink Jeep Tour to the Honanki ruins (12th-13th century cliff dwellings) and enjoyed staying in an outstanding B&B (the Creekside Inn), not to mention doing some great eating there and elsewhere on the trip! All-in-all a fine respite from working on books about Yellowstone. More about those later. 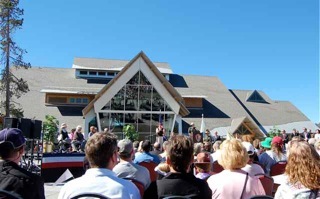 We were there when the new Old Faithful Visitor Education Center was dedicated and opened on August 25th. A sizeable group of visitors and interested employees of the park attended. The ceremony began with a real mounted color guard presenting the flag and continued with short speeches by Park Superintendent Suzanne Lewis (who will retire next month), NPS Director Jon Jarvis, and others important to the creation of the new building and its exhibits. It ended with lots of Yellowstone National Park pennant-waving and with the miracle of Old Faithful Geyser erupting just as keynote speaker, historian Paul Schullery, was concluding his inspirational remarks. At one point Schullery asked for a show of hands of people who remembered the first visitor center (then called a ranger station and museum), razed in about 1970. Of course, I raised my hand, since the exhibits at that museum and the kind rangers who worked there are fond memories of the years I got to live nearby as a little girl. The building itself is very roomy and quite impressive, with a long curved counter where rangers can answer your questions, an excellent bookstore, and a pair of exhibit rooms, dedicated to showing and explaining all the important aspects of Yellowstone’s hydrothermal features. They cover the caldera, the rocks formed in it, the various types of thermal features and their characteristics, life forms found near them, discoveries of features under Yellowstone Lake, microorganisms, and possible similarities to other planets and their moons. 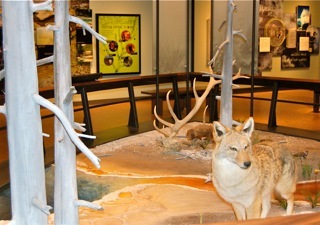 The centerpiece of the main room is a life-forms diorama, and of the young scientists’ room, a model geyser that builds up to a small eruption about every nine minutes. I was grouching before seeing it about the new museum being called an “education center,” thinking that people on vacation, especially schoolchildren, might not enjoy being told they are being educated. But I have to admit the curators have done an excellent job. Now—if only all those electronics can be kept operating!